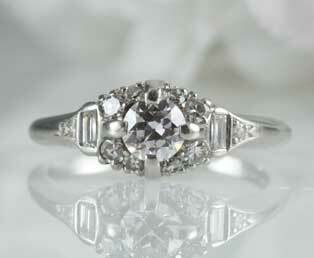 Luscious, gorgeous and superb design describe this estate old European-cut diamond platinum engagement ring. Prismatic light radiates from this central, high quality old-European cut diamond (0.34, VVS2, H). Two vertically aligned straight baguette diamonds bring extra fire from each side of this radiant central diamond. Further embellishing this rich, romantic engagement ring are ten white, glistening single cut diamonds positioned to enrich the elegance of this platinum ring. This spectacular estate European diamond engagement ring is a gorgeous vision of white on white. This estate European diamond engagement ring is crafted in sturdy, rich platinum. Platinum is known as the true white metal.